Why go? To stay in a comfy country house hotel that has all the grandeur but not the airs and graces. Set in impressively manicured grounds, The Wood Norton lies just west of Evesham and is within striking distance of the Cotswolds and Stratford-upon-Avon. Best for: A romantic weekend away where you can pretend to be lord and lady of the manor for 48 hours. Surrounded by open countryside, the Grade II listed building combines classic French period design with the relaxed hospitality (and facilities) you’d find in a swish London members’ club. The look: The Wood Norton was built in 1897 as a hunting lodge for European royalty, then bought by the BBC in 1939 – some episodes of Dr Who were filmed here. 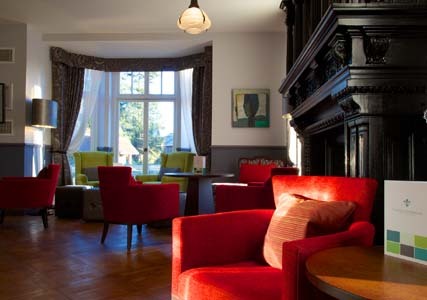 In 2012 it was re-opened after a comprehensive £4m refurbishment as a 50-room hotel. 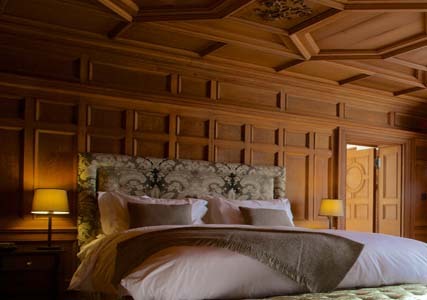 The larger bedrooms and suites feature elegant freestanding baths and interiors reminiscent of a French country house with original oak panelling. If you’re here for a special occasion treat yourself to the Duc d’Orleans junior suite, or if a modern look is more your bag the sleek standard doubles in the Pear Tree mews, with luxurious king-size beds and minimalist interiors, are excellent value. I’m hungry… The Wood Norton’s grand dining room looks out to the grounds and Bredon Hill, and serves a diverse menu of dishes locally sourced and excellently presented. Try the stand-out dish, stone bass served with sweet braised fennel, saffron potatoes and shrimp emulsion – fine dining at its best but without the pretension. The beef fillet with celeriac puree and wild mushrooms is also excellent – a three-course à la carte dinner costs £39.50. What really sets this place apart, though, is the service: professionally excellent yet unstuffy, warm and with a real sense of fun. A sumptuous breakfast is included in the room rates. While you’re there: Visit some of the nearby Cotswolds villages such as Broadway, Bredon and Chipping Campden, characterised by their honey-hued Cotswold stone, array of quaint tearooms and craft shops. 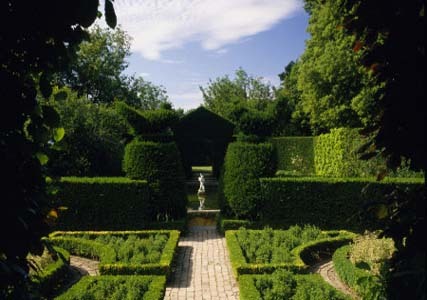 For a spring stroll, pay a visit to the Arts and Crafts gardens Hidcote (nationaltrust.org.uk), or go after Easter and pick up some books at the Chipping Norton Literary Festival (24-27 April, chiplitfest.com). Dress code: Pack a little black dress for dinner (smart jeans and a shirt are fine for him), but the hotel has a relaxed dress code during the day. Don’t forget your walking boots for exploring the sheep-filled surrounding fields after breakfast. Book now: The Wood Norton, Worcester Road, Evesham, Worcestershire WR11 4YB (01386 765 611; thewoodnorton.com). Double rooms with breakfast cost from £99, see the website for spring special offers. Wifi is complimentary. The nearest rail station is Evesham, a taxi takes five minutes and costs £6. Info: The Rough Guide to the Cotswolds (£12.99; Rough Guides) is a detailed guide, useful websites are cotswolds.info, cotswoldsvintagetours.com and escapetothecotswolds.org.uk.